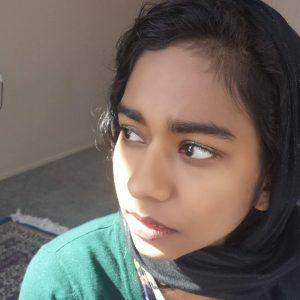 Kristina Marie Darling: Many of the poems in this folio are culled from your forthcoming book, Shahr-e-jaanaan: The City of the Beloved, which won the Kundiman Prize and will be published soon by Tupelo Press. How do these poems fit within the larger artistic vision of this project? Adeeba Shahid Talukder: My bipolar diagnosis and the events that led up to my first manic episode were very traumatic for me, and for years, I wanted to write something that did justice to that experience. But each time I tried, I fell short of conjuring up that sense of delirium, that grandiosity, that beauty, that danger. I think that’s what this book is— that poem I always wanted to write. In Shahr-e-jaanaan, I try to recall what it feels like to think myself so powerful that I become the beloved of Urdu ghazals, become beauty, become God. Equally frightening is coming out of this exalted state and plunging so low that I begin feeling hideous and wretched. Some of the poems that come out of this state are more contemplative and lower-energy, like “The Beloved” “the mosque an eyebrow, the tavern an eye,” and “mirror of the world,” which are, among other things, meditations on the limits of God’s power. During most of the episodes that followed, I was also in love, which brought a new meaning to the idea of power and its dynamics. Even as I felt beautiful, desirable, and powerful, I felt fragile beneath the weight of praise and attention. “The night of the fourteenth” and “Kathak: The Dance of the Courtesans” come from this place of vulnerability, this shackling, and the burden of being idealized. KMD: Your preface to Shahr-e-jaanaan: The City of the Beloved frames the book as an extended engagement with — and re-envisiong of — the Urdu poetic tradition. You explain, “I reference and pay homage to several poets throughout this book— among them Mirza Ghalib, Mir Taqi Mir, Faiz Ahmed Faiz, Allama Iqbal, Mirza Sauda, Noon Meem Rashid, Ibn-e-Insha, and Agha Shahid Ali. I have lived with these poets’ verses for so long that I know them by heart; they permeate my consciousness and are lenses through which I view the world, through which I write.” Where do the poems included in this folio fit within this larger project of response, homage, and deconstruction? AST: The Urdu poetic universe is full of laws and tropes that are fantastical and grandiose, and go against Western intuition. At times, I am a dweller of this world, and at others, I feel estranged and look at it with wonder, longing, and even perplexity. Because I write in English, I am always navigating between two spheres of thought, two traditions of literature. I write from this place of kash-makash, or tug-and-pull, and in many of the poems in Shahr-e-jaanaan, including the ones in this folio, I try to recreate this world and establish its tropes in the language I am most fluent. At times, I assume the audience’s familiarity with the laws as I work within them, and at others I am more of a guide. In these poems, I go between praise of these poets for writing verse that speaks universally to the human suffering that is love, and a need to distance myself from the culture of idealizing and idolizing women in a way that could be harmful. In “The night of the fourteenth,” for example, I take a poem of Ibn-e-Insha’s— a poem that I love, and that I often listen to in musical composition— and begin to approach it from a darker lens. What if all the men sitting in this gathering, talking about a beautiful woman, comparing her to the moon, are ill-intentioned? In “Kathak: The Dance of the Courtesans,” I similarly critique this obsession with beauty, how it is most satiated when women make spectacles of themselves. I admit, though, that I write about this because I trained in kathak for a year, and found it devastatingly beautiful and exalting, and that I still do. Again, this kash-makash. “the mosque an eyebrow, the tavern an eye,” “The Beloved,” and “mirror of the world” are all poems that assume the laws of the tradition, but apply them to conflicting ideologies, particularly some harmful interpretations of religious strictures. I wrote “mirror of the world” on the eve of the 2018 mid-term elections, and in the wake of the anti-blasphemy protests in Pakistan. The last two lines are influenced by Agha Shahid Ali’s translation of Faiz’s poem aa ga’ii fasl-e-sukuun, or “the harvest of silence is here.” I think about religion a lot; how some can turn it into a force of difficulty, strife, and a barrier to growth, but how it can also be a force of immense good and achieving the greatest human potential. I wrote this poem as a contemplation of symbolism and virtue, and as a return to Faiz’s vision of the beloved: an ideal for a just society. In the city of the beloved, who has remained pure? Who now remains worthy of the executioner’s hand? Friends! Gather your broken hearts and set out! Let it be us, once again. KMD: You also received an MFA from the University of Michigan. How was your experience of the these mentor texts from the Urdu tradition – and your apprenticeship as a reader and appreciator of literary art — different from your apprenticeship of a creative writing student at the University of Michigan? What holds true across the board when considering how we learn, change, and metamorphose as creative writers? AST: I would say my apprenticeship as a reader and appreciator of Urdu poetry is what has instilled in me a love of poetry and Urdu and a desire to create. It has also helped me develop a voice and aesthetic—I think that, even when I am not aware of it, something of Urdu and the way the language works enters my own diction. My time as a creative writing student at U of M has furthered this nurturing and helped me become a stronger writer; it has given me a conversation to enter, and a place in a community of writers. Both experiences have required humility and permeability on my part as a writer and reader as well as the cultivation of a desire to grow and evolve. The challenge in both has been to remain firm in my identity as a writer and to remain faithful to my own essence. For me, it’s important to consider others’ voices and opinions, but to resist being swept so far I lose myself. KMD: Do you think that all of writing is an act of response, a collaborative and dialogic endeavor, in which we are always haunting – and haunted by – our artistic inheritance? AST: I absolutely do think that. I do not think we can truthfully claim independence from those who came before us, or hold that our ideas emerge from nothing. Our intellectual histories are, to various degrees, crucial to the formation of our identities as writers and the way we move in the world. I feel, with each generation of poets, we are continuing the work of moving closer to meaning, to touching truth, to defining the undefineable. Even as we turn to our artistic lineage for guidance, we build upon and revise their vision to reflect our age. With each thought, with each poem, we get closer to this contact. KMD: What nonliterary texts were most formative for your thinking about your own aesthetic and your work as a creative practitioner? AST: I listen to music almost constantly, and one of the artists I return to again and again is Dawud Wharnsby— there is such careful attention to the lyrics in his songs, which are so beautiful and spare. I also listen to a lot of ghazals and songs by Mehdi Hassan, Noor Jahan, Nayyara Noor, and Ghulam Ali. I often listen to music as I write, as a way out of myself and into a space where I am able to envision possibility on a larger scale, to experience things beyond the material, beyond my immediate reality. At times, it helps me enter a state of spiritual ecstasy, and the act of writing becomes a means of connection to the divine. Music is an experience that is so different from what the written word alone can encompass, and sometimes in my writing I am just trying to translate its emotion and exaltation. Other than this, I feel that learning and thinking in languages other than English is important to my process, so I am drawn to dictionaries and textbooks. I am particularly obsessive about Urdu, Persian, and Arabic. Between these languages and English, I am able to think in different ways: both right to left and left to right. AST: I am currently working on ekphrastic poems after my friend Christopher Lucka’s photos. I think we approach creation in similar ways— his images evoke a grandiosity that both mirrors my voice as a poet and heightens the way I see the world. Chris is also one of the most brilliant photographers I know, and to be able to work with him in this way is a true honor. I am also excited about the poems I have been writing recently, which continue to play with the ideas of well-known Urdu ghazals, but with the intention of performance. In the ghazal-writing scene in American poetry, I have always perceived a lack of connection to the essence of the ghazal, and the way it is most commonly experienced in the subcontinent—through song. Because, for me, the two are inseparable, I have started to sing the composition to which the original verses have been set at readings before reciting my own poem. It is also because my own dialogue with the greatest verses has been in this kind of translation, in embodying their devastation, in letting it take over me and my breath. Other than that, I am starting to think about another collection, and the prospect of creating something of that scale again is big for me. Shahr-e-jaanaan both transformed me and broke me, and I wonder if I am ready to go through that process again.